We knew absolutely no one in the Fruita, Colorado area (or anywhere near it). We just picked it after a recent trip and liked the location, the small town feel, and all of the mountain biking, rock climbing, and hiking that it had to offer. Soon after we moved there, though, we started looking at RVs. Well, we looked at one RV, and we bought that one, haha! Buying that RV led to traveling full-time, and we haven't regret that choice one bit. 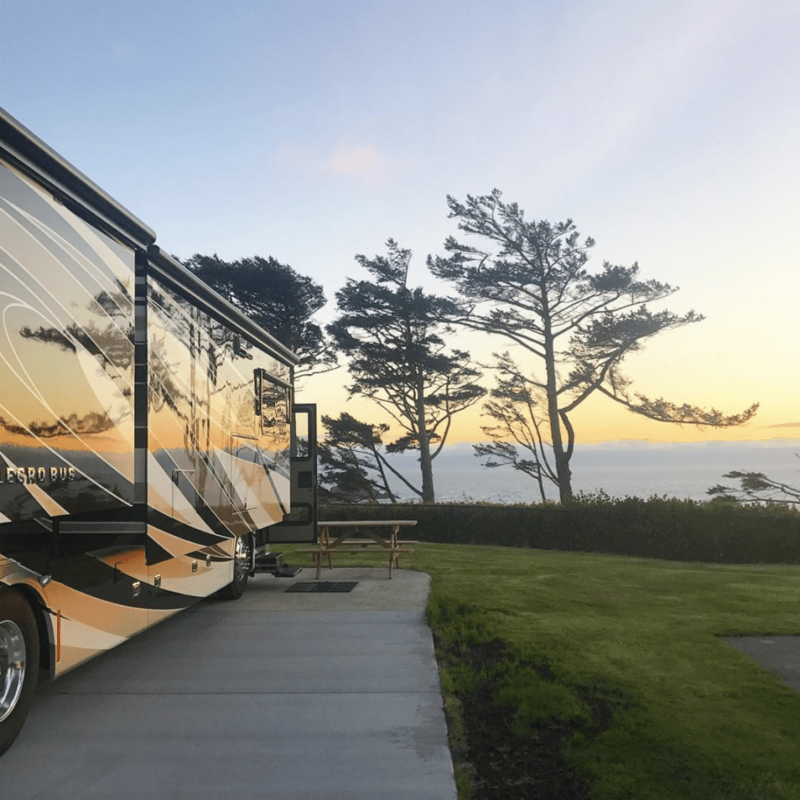 Last year, I published the April Fool's blog post I’m Tired Of Living In A Motorhome!, and tonnnnnns of you fell for it. Even though we've been RVing for some time now, I still absolutely love RV life. There's still a lot more to see, and I think it would be impossible to actually see all of the United States, even if we RVed for a decade. Traveling full-time allows me to live my dream life, and I'm looking forward to doing this for many more years. Living in an RV full-time is the experience of a lifetime, and we completely love it. I never thought I would be a full-time traveler, especially not an RVer, but I'm so glad I gave it a try. If any of you are thinking about doing the same, I highly recommend it! We've met many great people, we've made awesome friends on the road, we are exploring so many amazing places, and we are doing all of this comfortably from our home. Plus, even our dogs are happy traveling this way! Seriously, life couldn't be any better. Below are some updates about our full-time travel life. We don't plan on stopping anytime soon. While we don't have a date for when we will stop traveling, I'm sure that it will eventually happen sometime way into the future. For now, though, we absolutely love traveling full-time, and we're excited to see what the future brings. As discussed in My Year In Travels – Where I Went in 2017 – Hiking, Biking, RVing, Sailing, and More, we are debating between heading up to Alaska for the summer or purchasing a sailboat. Or, we may do both. We're not sure what we are going to do in 2018 just yet. That's the best part about traveling full-time – regardless of where we go and what we do, I know we will have a great time! A beautiful sunset we caught while parked on the Oregon coast. When we first decided to move into an RV, me and my husband told each other that if us or the dogs ever felt too cramped, we could rent the occasional Airbnb to have a little bit more space. We figured we needed a backup plan because living in the RV after selling our 2000 square foot house would be a major downsize. However, we’ve never needed to use that backup plan. 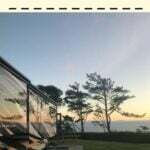 The only times we’ve rented Airbnbs while we've been RVing have been quick trips or when we wanted to make it a little easier for a dog sitter to watch our dogs (instead of asking them to manage the RV and dump the tanks!). There haven't been any times where we felt like the RV was too small. It's not hurting our relationship, our dogs are happy, and we are happy. Honestly, sometimes we feel like our RV is too big! And, we're not missing any of our stuff either. When we sold our house and decided to give RV life a try, we donated and got rid of a TON of stuff. At first it was difficult to get rid of so much, but then it got easier and easier. Now, all we have is what we have with us. We have a small amount of everything, and we like it best this way. We are much more mindful of what we buy, there's a lot less waste, and this is allowing us to save money as well. Storage units are a waste of money (for us). Okay, okay, I know they are not a waste for everyone, but they are probably a waste for 90% of the people who pay for them. In July 2016, we cleared out our storage unit and finally got rid of it. We were paying $185 a month for a small storage unit, mainly for photo albums and childhood items. It seemed wasteful to spend $185 a month to store things that we don't use. When we got the storage unit, I had to sign a paper that said we wouldn't store photo albums in there. In fact, I found out that this was normal. This felt like I was jinxing myself, and I was afraid that something would happen to the hundreds of photos albums that my dad left for me after he passed away. The storage unit was in an odd location. We put everything from our last house into storage. However, that was in a town where we knew nobody, and we knew that we wouldn't be going back too often. So, we rented a moving truck and had everything moved to Wes's parents attic. Don't worry, they lucked out as well. We gave them all of the expensive, new furniture that we had stupidly bought right before we fell in love with RV life, haha. It's been awhile since we got rid of that storage unit, and we haven't regretted it one bit. I still can't believe we were paying $185 a month for the stuff that was in there, especially since we would have never really even opened the storage unit! If we still had that storage unit and were still paying for it right now, that would have been over $5,000 in storage costs. That is a ton of money that we would have been wasting! This is me working in the RV. Plenty of space! I love being a digital nomad. Being able to work while traveling full-time isn't perfect, as it can be hard to separate work from life and actually take a day off. However, it's great being able to run my business from wherever I am. I can be in the RV driving down the road, at a national park, on a sailboat, at an Airbnb, or wherever, and I am still able to successfully work. What would I do for internet? What if everywhere we go has a bad signal? Or no signal?! However, I now know that being a digital nomad is great! And, none of the things above actually matter because there's a solution for everything. 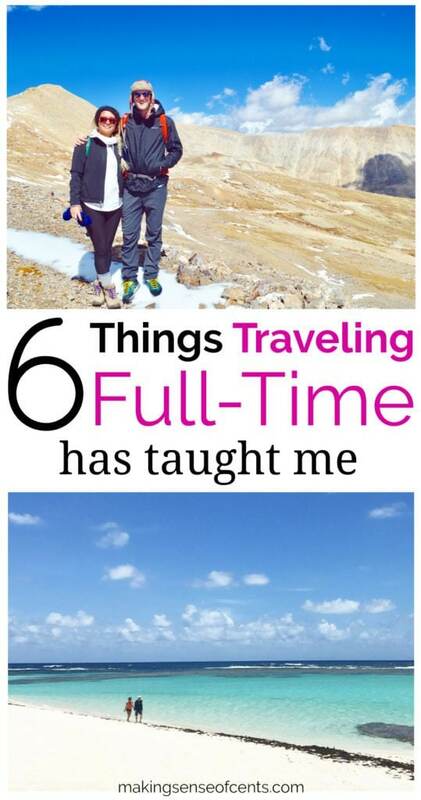 I actually believe that traveling full-time has helped me with my business. It is a huge motivator, and it’s really refreshing, which is very different from the stagnant work environment I came from. 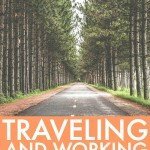 Note: Read more about how I earn a living on the road and How I Run A Business While Traveling 365 Days a Year. I don't need a lot of the things that I once thought I needed. Actually, probably even less than that. I know I'm not alone – many people keep items because they think they may need them in the future. You know the feeling – you buy something, don’t use it right away, and years later you find it but just can't throw it away, in case there is some circumstance where you need that exact item. Chances are that you won't miss it much. When I think about how much stuff we gave away, I honestly can't even remember half of the things. Now, I know that I never really needed the majority of those things in the first place. I know this because I have less stuff than I have ever had, and I’m actually happier now than ever before. You should only own something if you truly want it. Who cares about what everyone else has! You meet some interesting people while RVing. While traveling full-time in an RV, you definitely get to see the world from a different view. You meet a lot of interesting people, as when you're RVing you tend to be around a lot of other travelers, as well as a lot of strangers who want to ask you about your full-time travel life. We've met so many amazing people who are leading different lives, and it's always fascinating to hear all of their interesting stories. We've met famous photographers (such as for National Geographic! ), professional rock climbers, round the world sailors, long-term backpackers, bikepackers, someone who has walked across the United States, hundreds of full-time RVers, other travelers, and more, and they all have such interesting stories. We've never met so many extremely interesting people until we started traveling full-time (sorry to everyone back home, haha!) and put ourselves out there. I didn’t know you started your journey in Fruita. I love that area, the mountain bike trails are some of the best in the country! Agree!! We live here now and it’s amazing. I started RVing full time last year and it will be almost a year soon. I sold my house and everything in it. I’m not retirement age either. Just a solo woman seeking to LIVE abundantly and experience this beautiful world and people now. Good luck in your travels. Maybe we’ll bump into each other on the road. Michelle, you are making me wistful for life on the road! Kim and I have now been back longer than we were away. We’re also in the process of selling our Bigfoot motorhome. (We have a firm offer and are just waiting for some minor repairs before we close the deal.) But every time I get inside the thing, I get nostalgic for those 15 months we were traveling the U.S. Everything was simpler. There were zero pressures of modern living. And, as you say, there was plenty of space to get work done. I miss it. We absolutely love it! We’ll most likely be switching to sailing soon but we’ll be keeping our overland vehicle for hurricane seasons most likely. Yes!! Our goal at least in the next few years is to be able to for about 4-6months a year. We are wedding photographers with the bulk of our work in the Midwest so we would probably stay close to our “home base” during the summer months then spend the winter months on the road somewhere warm! I’m always intrigued by the idea but intimidated to actually drive an RV, haha. I think that it’d be a super cool experiment but after building our house and putting down roots it’s not really in our gameplan in the near future. Haha, I don’t drive it. Luckily Wes does all of that. Interesting to hear about your travels / what you’ve learned Michelle. Have you been up to the Banff / Jasper area at all? It’s beautiful and would highly recommend. Nope, not yet! We were going to the past two summers but each time we had something come up. This is definitely a dream of mine…living in and working from an RV. You are so blessed and your hard work is definitely paying off. Enjoy!!! I envisioned the RV being much smaller. That looks like a condo on wheels! Nice and spacious! We don’t have any desire to travel full time, but we’d certainly like to travel more. I love meeting new people, and your statements about meeting interesting people and seeing the world from another perspective are exactly why I enjoy travel. I think it’s amazing that you have found your dream life, you are living it and it works for you. At any time you decide that it doesn’t you can always change it up. Your RV size looks pretty nice in that pic. I went to Europe and traveled for six weeks and missed none of the stuff I’d left at home. Granted, it’s slightly different because I knew it was all there for me, however it did show me how little I actually need. Clothes, toiletries, laptop. I never heard of no photos in storage units (but I’ve also never had a storage unit). Why is that a rule?? I think it’s because they don’t want anything of sentimental value in there. Apparently it’s a very common rule. It’s great when you find a lifestyle that works for you. I personally love RVing for short stints, but couldn’t do it long term. Also, desiring a lot of kids, that’s not the option we wanted. However, we have made long vacations, and some mini-retirements work before we decided to just move to where we would want to retire. That was the best decision we made. But I’m re-reading Tim Ferriss’ 4 Hour Workweek and he has a huge chapter on, basically, becoming a digital nomad like you. Did you take tips from his book or were you guys doing this before you read about him? Your story + Tim’s stories are partly the inspiration for my husband and I, but downsizing also helps us achieve another goal – my husband becoming entirely debt free and able to do whatever he wants! We’re working on my debt, but I plan on working (as a digital nomad) for as long as I can, so our income will stay stable (for paying off my debt). Totally doable and SO glad to follow your travels, Michelle! I have never read anything from Tim Ferriss. I know who he is, but that’s all. Being a digital nomad is a sweet experience. You get exposed to different kinds of lifestyles and adapt to them. Keep it up. You said you’re not stopping any time soon, that means you are fully prepared for this. When will you start traveling? First of all – so cool you set up home base in Fruita! I don’t think I’ve ever been there, but I do love the state of Colorado. It’s very stunning. To be honest, I’d think RV life would be lonely because you’re moving around place to place. As someone with no idea about the lifestyle, it’s reassuring to know you’ve found ways to still meet tons of different people along the way. Thanks! It wasn’t our homebase for long, but we still love it. Thanks for sharing your experiences! I would never, in a million years, have thought of RVing full time but it really does sound wonderful. We can’t wait to be location independent to be able to have what you described–the ability to be in new, fresh environments. I always get tons of new ideas for posts when I’m traveling! The inside of your RV looks very spacious! 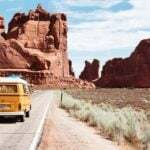 We love traveling and have definitely thought of doing RV traveling. 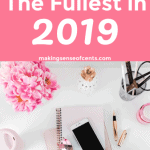 Since we have two kids and I don’t want to do homeschooling it wouldn’t be a full time option for us but definitely something for a few months at the time. The internet connection is something that I was curious about, will head over and read your related suggested articles. 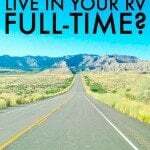 What has been your biggest struggle doing RV traveling full time? Thank you Michelle, a fun great read! This post is absolutely inspirational! I’ve been following your travels for awhile now and have been SO tempted to follow in your footsteps. I’ve been traveling a lot more recently and documenting my experiences on the blog. Maybe 2018 will be the year I take the full-time traveling leap? We’ll see! Until then, I’ll continue to live vicariously through you. 🙂 Thanks Michelle! Your story is so motivating to me and my husband! We’ve transitioned into remote jobs, RV part time and are planning to go full time within a year. One question we have-campsite fees end up being an enormous budget item. Do you have any tips to lower the cost? We need reliable cell service to work so can’t boondock and go off grid too often. The main way if you need to stay at an RV park would be to stay for at least a month so that you can get the monthly rate. This is so helpful! I’d heard of Harvest Hosts but hadn’t looked into it. Sounds like a great option. Thank you! I think about traveling full-time every once in a while. It would be awesome. Right now I’m focused on getting rid of this debt though. Ha! We would love to but we have dogs so we can’t leave them for that long. Do you miss the family and friends that you used to live near? Do you take trips to go see family/friends? How often? That and my husband’s job (teacher in a specialized program) are what keep us from moving away, but we love traveling / camping / hiking / RVing too! Many of our family and friends actually moved away around the same time as us, and after, so our friends and family are all over the country now. Due to that, RVing actually makes it easier to see them all! I really enjoyed reading this post. I reluctantly shared it with my wife, because she’s always wanted to try the RV lifestyle (or boat), and I’m a little hesitant. But your enthusiasm gives me more hope and confidence that we could pull this off, too! We’re actually planning to travel around the world for about a year first (via cruises, short-term rentals, and maybe even RV). And then when we come back to the States, do something similar to your plan. 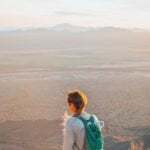 Traveling will also enhance the dedicated blogger’s career, because travel blogging teaches a blogger to document and video their surroundings and share with others in blog posts and YouTube videos. Great article! Being location independent is really nice. We’re coming up on close to 1 year, and we’re living by the beach right now in TX. Nice to have the flexibility this lifestyle. I agree on the storage unit as well. If you have stuff you don’t need, why are you paying to keep it? Like you, we also store a couple boxes at my wife’s parents with things like pictures that we wanted to keep but didn’t really want to lug around in the RV, but most of it was just purged if it didn’t fit.